Cookies like these above are a great alternative to expensive gifts so will help to keep costs down and you can really personalise them with a bit of creativity. If you are not good at baking and icing yourself, ask your Mom or Gran or maybe another family member to help you (or you could practise doing them yourself long before the time, by making cookies in small batches – just don’t “test” too many … you still need to fit into your wedding dress!). 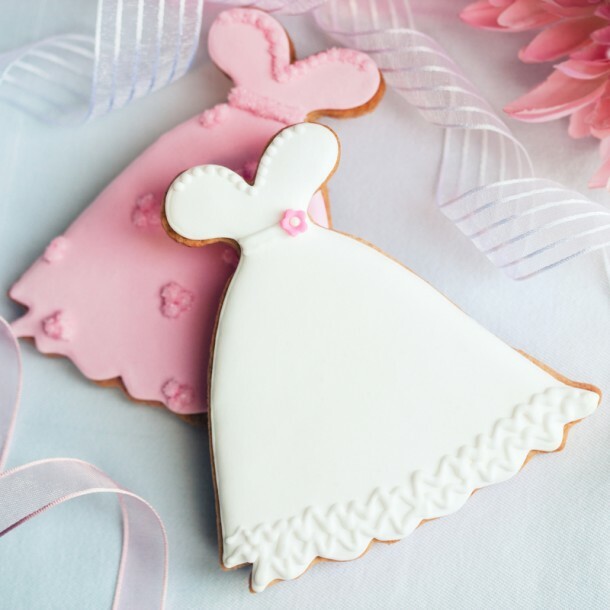 If you don’t have a recipe available do a Google search for “Wedding Favour Cookies recipe” … I tried this and found plenty of really easy recipes (and believe me – I can’t bake to save my life, but even I would try these!). I also found literally hundreds of ideas for different styles, shapes, types of cookies, all of which would make wonderful wedding favours and won’t cost a fortune! Let us know if you have any other ideas to add to this that you’d like to share with other brides-to-be by leaving a comment below!